The Clean Aircraft Concept is well defined within all global regulatory material, air carrier and deicing service provider programs and global standards such as SAE Aerospace Standard 6285. All of these documents clearly state that if winter contamination is adhering to any surface of the aircraft, with the exception of permissible contamination such as frost amounts on the fuselage and underwing of less than 3 mm, then the contamination SHALL be removed. There is absolutely nothing grey about this requirement. Yet somehow, most air carriers and deicing service providers still allow the pilot in command of the aircraft to request the type of de/anti-icing process that he or she wants. In the case of the aircraft in the photo above, the flight crew requested the common “wings and tail only, Type I and Type IV” even though the fuselage, cockpit windows and other surfaces of the aircraft were clearly covered with large amounts of snow and ice. This photo was taken as the aircraft was taxiing to the runway from the pad, as demonstrated by the Type IV fluid on the wing. Before I create a storm of controversy, the deicing service provider was diligent in this case and did advise the flight crew of the contamination on the aircraft more than once and suggested it be removed, but the captain declined the request, despite the clear need to remove it in the carrier’s program and the Aircraft Maintenance Manual. I suppose the flight crew believed it would simply blow off. But what if there was ice under the snow? How would the flight crew know? And despite the diligence demonstrated by the service provider in bringing the contamination to the attention of the flight crew, the service provider cannot be fully absolved either, as their deicing program also required that this contamination be removed. This was not an isolated case either. In fact, I was brought in to resolve numerous similar he-said-she-said situations during the past winter related to pilot request for deicing versus Clean Aircraft Concept, and I believe this to be an ongoing pressing issue right across the industry. 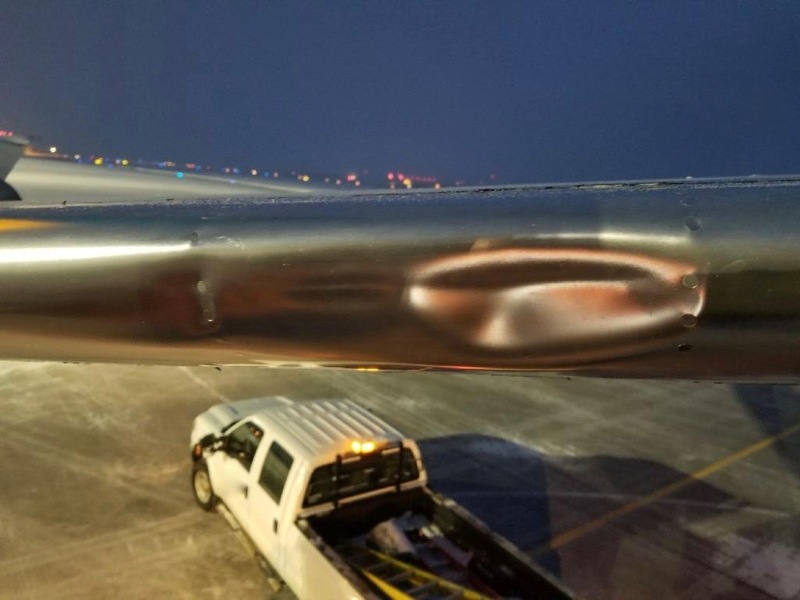 An airline colleague shared the following photo with me recently of damage caused by a chunk of ice that became dislodged in flight and damaged the leading edge of the horizontal stabilizer. The flight crew declined to have the contamination removed from the fuselage and cowlings as part of the deicing process. In my opinion, the issues identified herein need to be addressed in a black or white fashion to eliminate all grey. Much like cockpit resource management was implemented to ensure the safety of flight operations, a strong collaborative approach to deicing decision making needs to prevail and service providers and flight crews need to challenge each other and strictly enforce their respective programs, which require adhering contamination to be removed. If you can't confirm that contamination is not adhering, then remove it. Period. SureConsult will be working diligently with all of its clientele moving forward to ensure that these issues are clearly identified in all programs, training and quality assurance and that the previous grey areas and behaviours that enabled these situations to occur are adapted in favour of a more collaborative and decisive approach for all.